eBay Inc.’s position as one of the largest online retail companies in the world is hinged on the effective application of the firm’s mission and vision. A corporate mission statement determines what the business does. In contrast, a corporate vision statement describes a target future state of the business. In this case, eBay’s mission statement indicates business operations that include offering online auction services and related products. On the other hand, eBay’s vision statement informs managers about targets for business operations in the online retail industry and e-commerce market. The company’s strategies and strategic objectives for its operations and the operations of subsidiaries like Kijiji and StubHub are developed based on these statements. For example, Kijiji’s strategies for consumers in Canada and Italy are based on eBay’s corporate mission regarding overall online operations. In relation, eBay’s corporate vision gives strategic direction that aligns all the operations of the multinational business. Investors can use the corporate mission and corporate vision in evaluating eBay Inc. For example, the company’s mission statement shows investors what the business aims to do, with consideration for existing and new e-commerce operations. On the other hand, the company’s vision statement presents what investors can expect of the online retail business, such as in terms of plans for future growth and expansion in the global market. The company’s strategic management practices are also based on these corporate statements. The first component of eBay’s mission statement shows that the business revolves around a global trading platform. This means that the company offers its services internationally. Also, the multinational business uses information technologies, as implied by the term “platform.” The second component of the corporate mission indicates that the target users are all the people who are interested in using the global trading platform. In addition, the e-commerce platform allows the trade of practically anything, as stated in the third component. These components of eBay’s corporate mission direct management to ensure business growth through strategies that include technological enhancement. For example, the company strategically expands its operations through the acquisition of related online technology firms like StubHub. eBay Inc.’s generic strategy for competitive advantage and intensive strategies for growth are based on the corporate mission statement. Similarly, this mission is a basis for the company’s corporate vision statement. The first component of eBay’s vision statement clearly specifies the aim for leadership in the online auction and retail market. This aim implies that the company sees itself as the future top player in the industry. 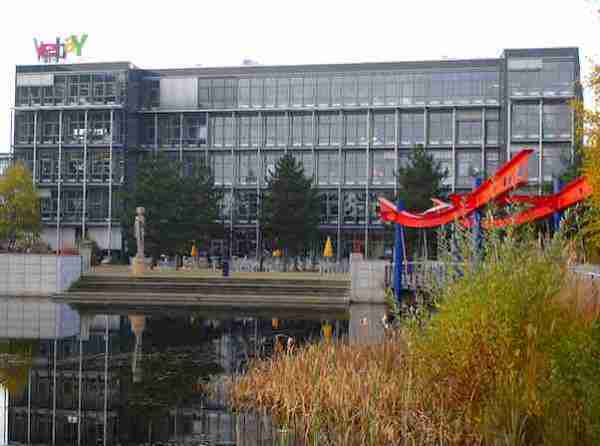 In addition, eBay’s corporate vision statement shows that such leadership is in terms of enabling the world in discovering great value and unique selection. Considering the company’s corporate mission statement, the value and selection stated in this vision are for sellers and buyers or consumers worldwide. Fulfilling this corporate vision requires effective strategic use of competitive advantages based on business strengths, such as the ones identified in the SWOT Analysis of eBay Inc. Moreover, to become the “world’s favorite destination,” the company must overcome competition with firms like Amazon, Etsy, Rakuten, Newegg, and Bonanza, as well as eBid, Ruby Lane, eCrater, Alibaba, and Walmart, whose Marketplace is a direct competitor. The e-commerce business faces strong competition in the global online retail market, as determined in the Porter’s Five Forces Analysis of eBay Inc. Because of the aim for industry leadership specified in the corporate vision statement, the company’s managers are expected to enact strategies for business growth, high quality of services, and operational efficiency. For example, quality improvement strategies are expected for the company’s core business and the operations of subsidiaries like Kijiji. Corporate Mission Statement. eBay’s mission statement satisfies most of the conventional requirements in writing ideal mission statements. For example, the company’s corporate mission statement specifies the nature of the business (global trading platform), target customers (anyone or all sellers and consumers), scope of operations and market (global), products (online trading, e-commerce retail services), technology (implied online digital technology), and self-concept (practical). However, a recommendation to improve eBay Inc.’s corporate mission is to complete it by adding information about business philosophy, public image and human resources. This recommendation can enhance corresponding strategic management. Corporate Vision Statement. eBay’s vision statement satisfies most of the requirements in writing ideal vision statements. For instance, the company’s corporate vision is concise, clear, future oriented and stable for the long term. It is also abstract enough to suit all relevant operations of the e-commerce retail business. Moreover, it is challenging and inspiring, such as in terms of its focus on becoming the world’s favorite. However, the company presents this statement as its corporate mission statement, which creates potential confusion and misguidance in strategic management and decision-making processes. As shown in the preceding analysis, the statement is technically a corporate vision statement because of its characteristics. Thus, a recommendation is that eBay Inc. label the statement as its corporate vision. In this way, the company can expect higher strategic accuracy in fulfill its aims for the future of its multinational business. eBay Inc. – Form 10-K.
eBay Inc. – Who We Are. Han, S. (2008). Navigating Technomedia: Caught in the Web. Rowman & Littlefield. Kirkpatrick, S. A. (2016). Build a better vision statement: Extending research with practical advice. Rowman & Littlefield. Kirkpatrick, S. A. (2017). Toward a Grounded Theory: A Qualitative Study of Vision Statement Development. Journal of Management Policy and Practice, 18(1), 87. Pace, S. (2017). Shaping Corporate Brands: From Product Features to Corporate Mission. International Studies of Management & Organization, 47(2), 197-205. Singal, A. K., & Jain, A. K. (2013). An empirical examination of the influence of corporate vision on internationalization. Strategic Change, 22(5-6), 243-257. U.S. Department of Commerce – International Trade Administration – Retail Services Spotlight – The Retail Services Industry in the United States.